Mr. Beall’s famous, but controversial, list included about 1,200 publications and 1,000 publishers. However, he abruptly deleted his list in mid-January, partly because he was worn out by publishers who threatened him and harassed his colleagues, he said. Also, in a recent article in the journal Biochemia Medica, Mr. Beall wrote that he’d received “intense pressure” from his university about the list and, “fearing for my job,” he shut it down. Kathleen Berryman, senior project manager at Cabells, said her company had discovered Beall’s List a few years ago and used it to help clean up their whitelist of 13,000 reputable scholarly publications (a whitelist names publications that are considered legitimate, while a blacklist lists those judged to be suspicious). However, she said the company soon realized that academics needed a bigger, companion blacklist to track the skyrocketing number of deceptive journals. Its website quotes researchers from the Hanken School of Economics, in Finland, who noted that the number of articles published in about 8,000 predatory journals jumped from 53,000 in 2010 to an estimated 420,000 in 2014. An example of some of the journals on the new Cabells blacklist. Screenshot courtesy of Cabells. Now, after investing hundreds of thousands of dollars and one-and-a-half years of work, Cabells has launched the Journal Blacklist, Ms. Berryman said. The inaugural list contains nearly 4,000 deceptive journals. “We’re getting away from the word ‘predatory,’ and we’re using ‘deceptive,’ because ‘predatory’ has become misunderstood,” she said. “We have developed … an objective, transparent process, and we excluded opinion-based decisions,” Ms. Berryman said. Beall’s List had been criticized for relying on too much opinion from a single individual in deciding which journals were predatory. An example of a “deceptive journal” profile on Cabells list. Screenshot courtesy of Cabells. The list also doesn’t include journal publishers. “Many legitimate publishers may also have journals that are deceptive, so by focusing on journals, not publishers, that allows us to include them,” she said. The list includes both subscription-based and open-access journals. Each journal on the blacklist is accompanied by a list of its violations, so, at a glance, readers can see exactly why a journal landed there. Some of the reasons are obvious (such as stealing the name of a legitimate journal), while others are more subtle (such as a lack of policies for the digital preservation of articles). The new blacklist is accessible only by subscription. Ms. Berryman said the main subscribers are universities and research companies, with the price based on a sliding scale that depends on the size of the institution or company. She refused to give the price range, saying that institutions can receive estimates directly from Cabells. Beall’s List was free, and reportedly received up to 20,000 pageviews a day. “Our initial plan was to offer it for free,” Ms. Berryman explained, “but as time and resources grew, we realized that wasn’t sustainable.” However, she said the company hopes that the list will be freely available one day. But he is supportive of the new Cabells initiative. “What I like about Cabells is the transparency of the criteria,” he said. The journal publishes papers that are not academic at all; e.g. essays by laypeople or obvious pseudo-science. The journal does not indicate that there are any fees associated with publication, review, submission, etc., but the author is charged a fee after submitting a manuscript. Encouraging a culture of open critique of individual papers no matter where they’re published is more valuable to science than any concept of blacklists or whitelists which are really just apologists for hierarchical and non productive academic practices. They simply feed into publishing oligopolies and worse, justify institutional monopolies on elite output forums. My general opinion on Cabells’ blacklist, and on blacklists in general, is accurately portrayed in this article. I would nevertheless like to add some further explanations. 1. 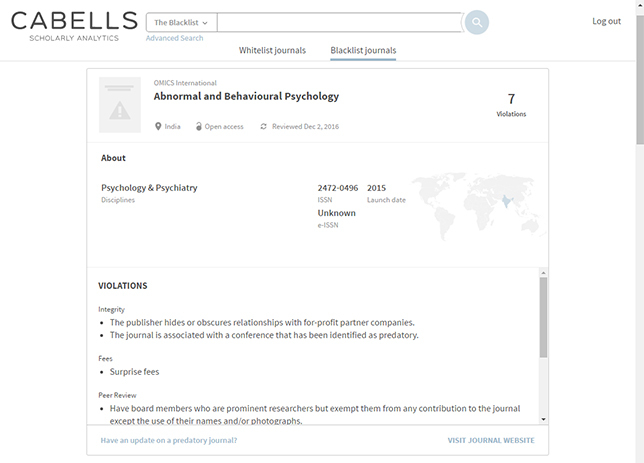 By “transparency of the [Cabells’] criteria”, I meant not only that the list of criteria is publicly available but, more importantly, that the specific criteria which led to the inclusion of each journal are also available (as far as I can tell from what is found on Cabells’ website, not having access to the list itself). 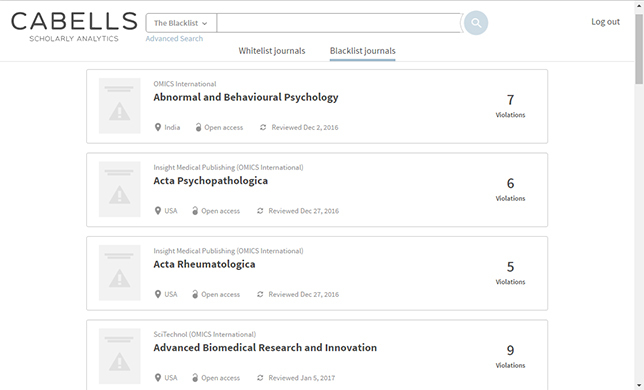 Other blacklists, like Beall’s and DOAJ’s (which hosts a list of nearly 2000 journals removed for “not adhering to best practices” or “suspected misconduct”, http://bit.ly/1cPK4Lr) also make their criteria available, but the detailed reasons for the inclusion of each journal (and publisher, in the case of Beall) are hard to find, if disclosed at all. 2. Cabells’ blacklist uses about the same number of criteria than Beall’s (~ 60). While the majority are equivalent or similar to those of Beall, some of the more questionable or fuzzy among the latter were not retained. However, in the whole, Cabells’ criteria still cover a large spectrum of issues, ranging from outright dishonesty or misinformation to arguably sub-optimal practices. Some of these, notably in the case of small journals, are more a consequence of limited resources than of lack of rigour or intent to deceive. This is one reason why a detailed justification of inclusion for each journal is important, as it helps researchers make their own judgments – as they always should do anyway – on the suitability of the journal. 3. I concur with David Moher that a main drawback of Cabells’ list is its paywall. This is particularly important if one considers the well-documented issues of the use of so-called “predatory” journals by researchers from emerging countries. It could well be that those who most need the list will be the less able to access it. Finally, there has been much debate on the importance – both in terms of number of papers and of global influence on scholarly publishing – of the phenomenon of “deceptive” journals (a more appropriate qualifier than “predatory”). One can only hope that Cabells’ initiative will help us progress towards a more nuanced perspective. For instance, I strongly suspect than the number of papers published annually in truly deceptive journals will be much lower than the figure mentioned in the article (420 000 papers in Beall’s list journals), which is itself disputed (see http://walt.lishost.org/2017/04/the-problems-with-shenbjorks-420000). Interestingly, Cabell’s International website does not identify a physical address. Can we consider it a deceptive company?